"Do YOU know who killed JonBenet Ramsey?" Netflix has debuted a trailer for the highly acclaimed, totally unique documentary Casting JonBenet, from director Kitty Green. The film originally premiered at the Sundance Film Festival earlier this year, and it has also played at the Berlin Film Festival and True/False Film Festival. Casting JonBenet examines the infamous JonBenet Ramsey murder in Colorado in 1996, by having local actors from Colorado audition for the various characters involved in the story. This includes JonBenet herself, as well as her mother, brother, father, and local police. This is a fascinating documentary unlike any other (except maybe Kate Plays Christine) that stirs up quite a unique discussion without ever actually interviewing the real people. It's fascinating, and worth checking out when it premieres on Netflix. In 1996, Boulder, Colorado was rocked by the mysterious death of six-year-old pageant queen, JonBenet Ramsey. Two decades later, director Kitty Green returns to audition local actors, unpacking how each remembers and relates to the ill-fated Ramsey family. A darkly moving exploration of crime, guilt and personal bias, Casting JonBenet expertly blurs the lines between documentary and drama. 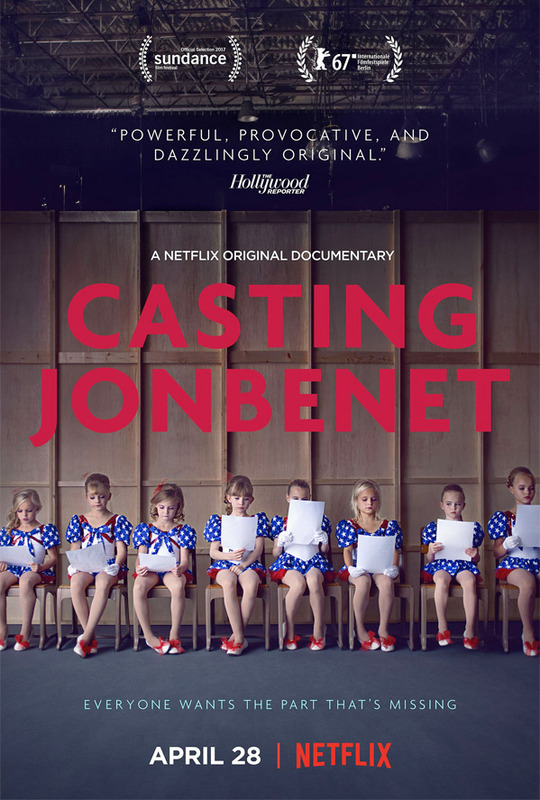 Casting JonBenet is directed by Australian filmmaker Kitty Green, of the doc Ukraine Is Not a Brothel previously. This first premiered at the Sundance Film Festival in January. Netflix will release Green's Casting JonBenet streaming exclusively on April 28th this spring. This doc is highly recommended. Head to Netflix for info.